Whenever a unit ends it move or leaves a hex containing this Obstacle, the unit's controller rolls a die. On a 3 or less, put a face-up Disrupted counter on that unit. Q: I can't find the rules covering obstacles or fortifications like Minefields. Where are they? What do they say? A: This has been changed as of the 11/12/2009 Rules Update document. Minefields are now deployed just like Fortifications. Q: The Fortification special ability says the obstacles are place "in turn". What does that mean? A: Once the first player is determined after the initial coin flip, that player deploys all his Fortifications. Then the second player deploys all his Fortifications. After all Fortifications have been deployed, deploy units normally. Q: When an Engineer enters a hex with a Minefield obstacle, which ability occurs first, the Minefield ability or the Engineer ability? A: Because the Demolitions attempt happens at the end of the phase, the mines get to attack first. Special abilities can be used while disrupted, however, so the Demolitions attempt can still be made even if the engineer is disrupted. Q: If an engineer or pioneer unit destroys a minefield is it removed from the board immediately? A: Yes. The obstacle would be removed immediately making the hex passable immediately. Q: Does an engineer or pioneer get two shots to destroy the minefield, one at the end of movement phase and one at the end of assault phase? A: No. Only during the assault phase. Q: The Minefield SA says "whenever a unit ends it move or leaves a hex…" Can you confirm that "units" doesn't include aircraft? A: Aircraft are units. But they don't "enter'" or "leave" a hex. They are placed in a hex, so they don't meet the conditions of the Minefield special ability. Q: When you roll for a unit attempting to leave a minefield and the result is face-up disruption, does it get the counter in the minefield hex or does it still manage to leave the minefield and it is then disrupted in the adjacent hex? A: It stays in the Minefield. Q: This still isn't clear to me. If my unit stays in a hex containing a minefield, do I need to roll for it on future movement and assault phases even if I didn't move? A: Yes. 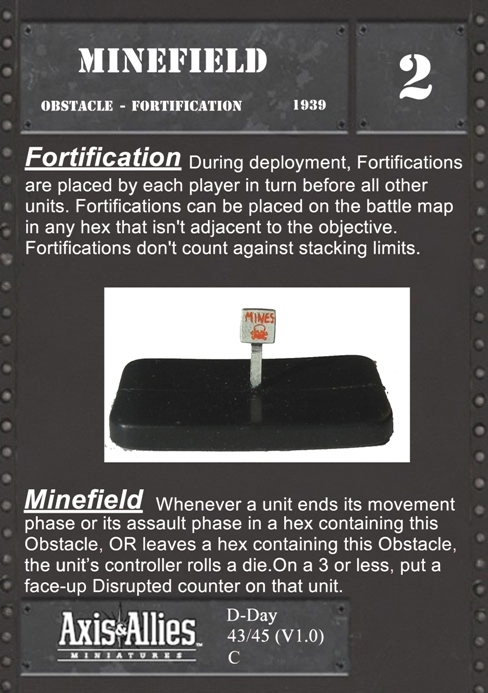 The 11/12/09 clarification document says; "Whenever a unit enters a hex containing this Obstacle, or ends its movement phase or assault phase in a hex containing this Obstacle, the unit's controller rolls a die. On a 3 or less, put a face-up Disrupted counter on that unit."